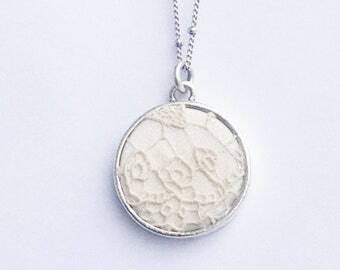 Announcement Handmade in Vermont, each Ceci Leibovitz keepsake, memory or memorial necklace is like a little time capsule, capturing your important memories and moments of history. You can have a custom necklace that highlights lace from your wedding, a piece of special baby clothing, or fabric from an item that once belonged to a dear relative. 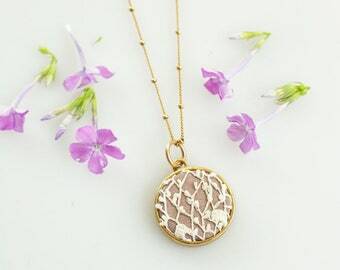 Handmade in Vermont, each Ceci Leibovitz keepsake, memory or memorial necklace is like a little time capsule, capturing your important memories and moments of history. You can have a custom necklace that highlights lace from your wedding, a piece of special baby clothing, or fabric from an item that once belonged to a dear relative. Beautiful handmade jewelry, fast delivery, and with lovely packaging (as a bonus!). Looking forward to seeing her new creations! Absolutely beautiful piece of artwork, exactly as described, sent promptly in a cute box. There is a surprise in every custom wedding memory necklace I create. I bring out these hidden motifs by cutting into the fabric in a deliberate way, choosing just the right segment for most interesting outcome. One of the new memorial pendant necklaces custom made with fabric from a lost loved one's clothing item. I made this custom memory necklace using a swatch from the client's father's shirt fabric along with a button and small Czech glass bead to add sparkle. A beautiful way to honor a lost loved one. A button charm can be added to any of my necklace styles. Ceci Leibovitz fabric memory necklaces honor important events, milestones and people - they are sweet reminders and givers of comfort, keeping memories close. A very personal and special kind of jewelry, these custom necklaces can be a meaningful gift to yourself, as well as to others, symbolizing the shared importance between you, of an event, milestone, or dear departed relative. Each piece of Ceci Leibovitz jewelry has one connecting thread in common: it is custom made specifically to your needs, incorporating a swatch of fabric that is significant in some way to your life. Your custom necklace will be like no other in the world, unique to the design we will create together. It can be made in multiples, if you would like to gift a necklace to more than one person. 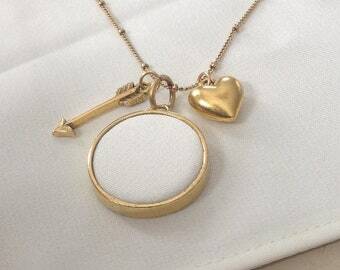 There are three main necklace categories: Bridal, Baby and Memorial, though a necklace can be made using any type of fabric, for example a swatch from a favorite article of clothing that you'd like to preserve and continue to enjoy, even though it no longer fits you, or is worn out. 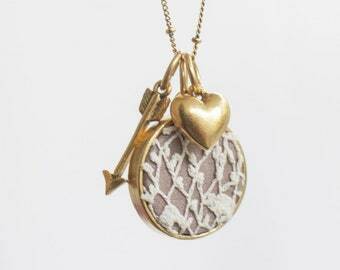 The Memorial Necklace designs were created when, after the loss of her spouse, artist Ceci Leibovitz noticed a lack in the marketplace of attractive and truly 'personalized to the wearer' jewelry in this category. A very special and personal necklace is designed specifically for the individual who is experiencing loss, with the purpose of bringing comfort on a daily basis. 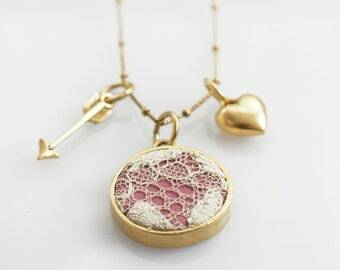 These necklaces incorporate an actual swatch of fabric from an item of clothing once worn by the lost loved one, as well as the optional inclusion of meaningful charms and/or beads in colors that coordinate with the fabric, or have special significance, whether a birthstone, flower bead, star, heart, eye color, favorite color, initial etc. A button from the loved one's clothing can also be used and often brings a strong feeling of familiarity to the piece. ... easily be made using your own fabric, either by asking your seamstress for a swatch, or cutting a piece from an inner seam. ... be made from the wedding gown fabric of a mother, grandmother or other relative and worn on your wedding day. A nice idea, especially if you're not able to wear the gown, but still want to have a reminder of it at your wedding. ... be used as a memorial bouquet charm, made with lace, or other fabric from the dress of a departed relative who you would like to honor at your wedding. After the day is over, you can wear it as a necklace. ... be purchased by a bride either before her wedding to wear on the special day, or after to be worn on a daily basis. ... be made with a silk fabric beneath lace, in a wedding color, or a favorite color to coordinate with outfits, ivory, or white, or black to add a little more contrast to the lace. ... be given as a gift to bridesmaids. ... be given by a bridesmaid or maid of honor, as a gift to the bride. ... be gifted by a fiance to his bride to be. ... be gifted to the mother of the bride. ... be gifted to the mother of the groom. ... make a thoughtful Valentine's Day gift. ... be given as a 13th wedding anniversary gift by a husband to his wife. This is the traditional 'lace' year for anniversary gifts. A variety of charms can be added to further personalize the piece, for example a shell to symbolize a beach wedding, a hibiscus flower bead, a gold heart and arrow etc. Just about every bride who has seen these necklaces in person loves the idea of preserving a piece of their special day in such a unique and meaningful way! Using actual fabric from an article of baby clothing, these necklaces are the ultimate way to record memories from your child's younger years! If you are making a baby memory quilt, simply save a square of fabric from an article of clothing, or lightweight baby blanket to have a necklace made too! A star charm hand stamped with baby's initial can be added to the piece, along with a birthstone or favorite color bead. A lovely gift to mom on Mother's day, for grandmothers, or a mother of the bride and mother of the groom on your wedding day. Sturdy materials of the highest quality available are a top priority for me in creating my jewelry. The pendant frames and charms I use are 24 karat gold and sterling silver plated pewter, and made in the USA. All of the chains are 24 karat gold and sterling silver plated solid brass. I use Czech glass beads in my work. These materials cost me more but this expense is well worth it for superior pieces that will last. Hello! My name is Cecilia. I design and make all of the necklaces at Ceci Leibovitz.